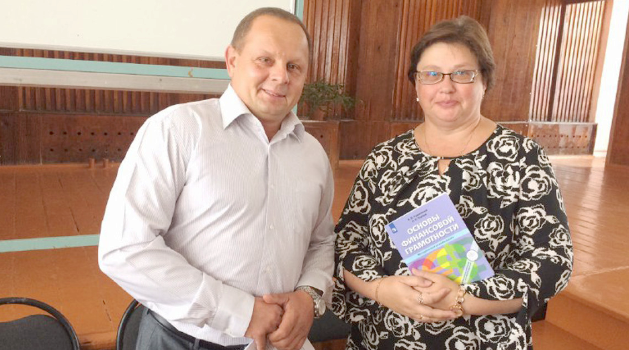 Two general educational institutions in Bezhitze have got textbooks of methods for teachers and course books and workbooks for senior pupils. Many of them have got interested in the new subject – the basics of financial literacy. And now the adults are expressing their wish to attend lessons. The schools do not exclude such opportunity. In Russia only a small part of population is familiar with the services and products offered by financial institutions. At the same time, such a smart tough in finance person can competently manage his money, keeping records of incomes and expenses and avoiding excessive debt through planning his personal budget and practicing conscious awareness, rather than impulse purchases. And also such person is able to build up savings and profitably use savings and insurance tools in the future. The economic development of the country depends on the general level of financial literacy of the population. Therefore, now at the state level the decision is made to educated people to assess correctly the situation at the market and take reasonable decisions. It is planned that such an increase in awareness in finance matters will reduce the arrears on consumer loans and reduce the number of people who have fallen into the hands of scammers. Some regions of the country have already introduced the new subject and are giving a grade for it under the Federal Program for increasing financial literacy. In our city this subject is still optional. But, as they say in schools, many people think that it is a hot-button issue. — We have elaborated optional course for 10th and 11th grades, – says Ekaterina CHUIKO, the teacher of history and social studies of the 39th school of Bryansk. — First only 6-7 pupils attended. But, after initial lessons were held, where we talked about bread and butter things: loans, life and property insurance, distribution of our resources and planning the family budget, then those who wanted, slowly began to pull themselves into classrooms, and by the end of the last academic year each group consisted of 16-17 pupils. This year, parents are asking about the opportunity to participate in such interesting lessons together with their children, they are concerned about retirement savings and improvement of their financial position before reaching senior citizens’ age. But in order to spark the interest of children and adults in financial matters, teachers had to do a great deal of independent work, looking for theoretical information on the new subject in legislation acts, the Internet, news or on the rare courses and trainings, gaining experience through their own mistakes. — The textbooks do not address this issue, and if it is described there, then at the level of ‘what is money’ and ‘what are banks’? To explain to the child what is it all about financial literacy, it was necessary to understand it first. Sometimes I read the text and thought that even I did not know this. But now I treat my own savings differently and look after my purchases in a different way, – says Elena POTZELUEVA, the teacher of history and social studies at the second Bryansk gymnasium. — Many 14-year-old teenagers have the opportunity to work, even if only with the permission from their parents. When they receive their first salary, it’s quite another attitude to money, they really want to put them aside, save them, and then buy something necessary with a sense of pride that he himself has bought the thing. Let it be a small thing – a book or high quality professional album for drawing, children learn to value money and understand that not only their parents can be the source of money. More than 50 course books on the basics of financial literacy and the same number of workbooks together with methodical literature were allocated to Bryansk schools by financial sector entrepreneurs within the framework of the All-Russian charitable action “Give a textbook as present to the school”. Teachers say that thanks to this action they will now be able to fully and effectively communicate the new useful subject to the senior pupils. Mikhail STRATEICHUK – the regional director of Vyruchai- Dengi Company during the presentation of the new course books answered questions of children mostly interested in loans and their types. The guest of honor shared his own financial experience with the students and said that the textbooks presented to the school not only describe existing loans nowadays, but also give advise how to reduce the interest rate on loans. — In Bryansk schools the lessons on financial literacy are optional, usually children, who are preparing for thematic Olympiads and plan to connect the future profession with the economy study this subject. But such knowledge is useful to everyone. Even if the child quickly runs through the subject he obtains the concept and understanding of the proper distribution of his own money in everyday life. For example, if a student abandons harmful delicacies, even if it is just chips, then he will save hypothetical 50 rubles a day. It seems a bit, but in a month it’s already fifteen hundred, and for the year 18 thousand will be collected, — Mikhail Strateiychuk believes. As the head teacher of the 39th school of Bryansk Galina MAKARIDINA noted, within the framework of the program of social studies for the senior classes there are reserved lessons, which can be used for such course. It is good to formalize it into a separate subject lesson, she believes. — Unfortunately, financial literacy does not included in the lessons’ schedule as the separate subject. “We believe that children who leave from school into adulthood life should have at least certain knowledge on this issue, so we try to include the subject at least in the framework of supplementary education,” said the Director of Studies the second Bryansk gymnasium Galina POLEKHINA. Meanwhile, young entrepreneurs are already growing up in local schools. So the pupil of the 11th grade of the 39th school in Bryansk Danila MOISSEENKO breeds exotic plants and animals. Thanks to financial literacy, he was able to calculate the costs and revenues and come to the conclusion that such home business pays for itself. And his project became a winner of the regional competition of research works “Future Scientists”. But, admits Danila, at the beginning it was not that smooth. — “In 2014, for the first time I participated in the Olympiad in financial literacy among the 9th grades. Immediately I came across the fact that many things are not clear. Last year the optional courses were started and I learned new information related to the economy, entrepreneurship and banks, which helped to pass the second stage of the Olympiad. Soon there will be the third stage of our participation, it’s already easier, because we know something and can do something, and with the help of new textbooks we can expand our horizons even more’ – says the senior pupil. According to teachers, the earnings potential of their own money provoked serious interest among schoolchildren. Thanks to the city program, many of them were able to earn money from June 1 to June 30, in advance adjusting their school schedule and getting information about payment, and now they are trying to clarify whether this period will enter their employment record. Apparently parents may tentatively start discussing money matters with the child at the age of 10 years. Participation in budget planning will allow him to feel a full-fledged member of the family. Now, unfortunately, the overwhelming majority of parents do not talk to their children about money at all, because they do not keep records of their own. And in fact sometimes such dialogue serve well all of them. For example, Ekaterina Chuiko remembered how her student discovered gaps in the financial literacy of his parents. It turned out that his father spent more money on the car than on his relatives. — Money can be spent not only on all sorts of bits and kits. I understand that money are not easy to get and they are not endless so one needs to use them rationally enough. First of all buy what is necessary, and then see how much one has left and whether this amount is enough for what else one wants – speculates the pupil of the 11th grade of the 39th school of Bryansk Lera NIKITINA. Today, the Ministry of Education, the Ministry of Finance, the Bank of Russia, other authorities, as well as Russian and international financial and public organizations are developing the financial literacy programs in the country. The course book “ABC of finance – basic concepts” was developed by a team of professional financiers-practitioners and approved by the Central Bank of the Russian Federation. Since this year, modules on the ABC of finance have been included in the basic education program of secondary schools. Financial literacy is studied within the scope of subjects – social studies and economics – or as an additional subject as may be selected by the pupils. On a nationwide scale on September 1 this year 127 flagship schools from 66 regions and 212 pilot schools from 46 regions will start the lessons of financial literacy.